Rudin Management’s proposed townhouses and residential tower along West 11th Street. Image: FXFOWLE Architects. After more than a year and nine meetings, Landmarks approved final component of St. Vincent’s plan. On July 7, 2009, Landmarks approved Rudin Management’s amended plan for the redevelopment of the St. Vincent’s Hospital complex into a residential development. The complex is located between Sixth and Seventh Avenues and West 11th and 12th Streets in the Greenwich Village Historic District. St. Vincent’s plans to consolidate its hospital operations into one building located on the west side of Seventh Avenue on the site of the O’Toole Building, which was approved for demolition by Landmarks in October 2008. Controversial aspects of Rudin’s plan included the massing of a proposed residential building along Seventh Avenue, proposed townhouses along West 11th Street, and alterations to historic buildings at the site. 6 CityLand 76 (June 15, 2009). The proposal had been fine-tuned several times at prior meetings, including reducing the Seventh Avenue building’s originally proposed height from 266 to 233 feet, and then later, to 218 feet. At the July 7 hearing, FXFowle architect Dan Kaplan presented the final plan. Among the design modifications, Rudin proposed to reduce the height of the building on the east side of Seventh Avenue by another 15 feet, down to 203 feet, and include a series of setbacks. 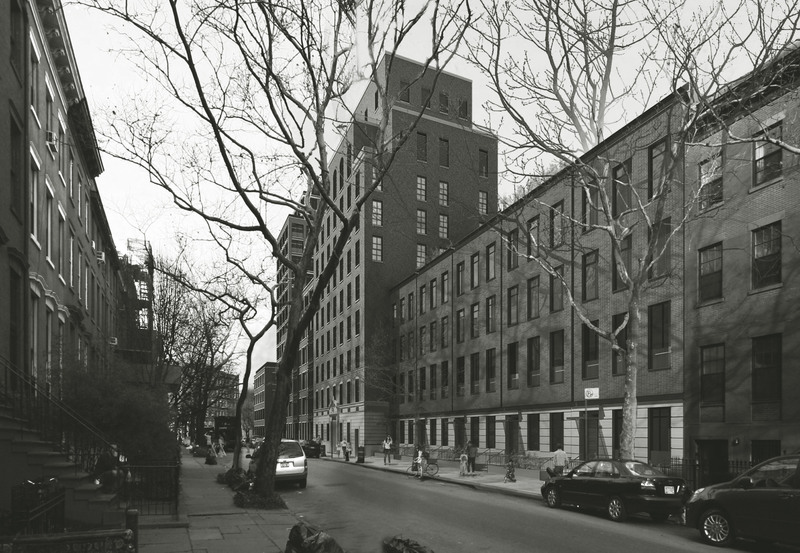 Rudin also made slight alterations to the facades of the townhouses on West 11th Street. Chair Robert B. Tierney stated that the lengthy process had “posed some of the most complex historic preservation issues in recent memory.” In urging approval, he stated that the proposal successfully met the challenge of “knitting together the old and the new.” Commissioner Margery Perlmutter, casting herself as “the sole dissenter,” argued that the Seventh Avenue building was too tall and said that each building in the proposal should be individually considered for separate certificates of approval. Landmarks voted to approve with only Perlmutter opposing. LPC: 1 Seventh Avenue, Manhattan (COFA# 08-4934) (July 7, 2009).